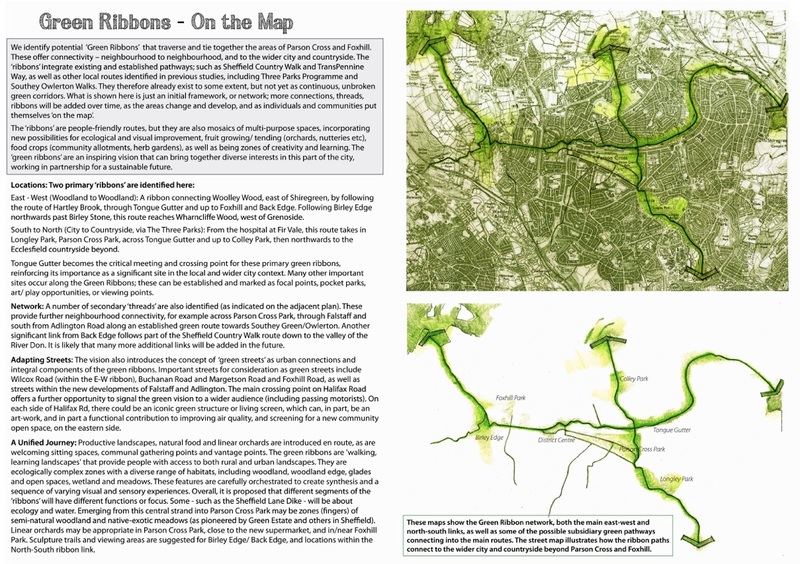 The 'Green Ribbons' themes include: Nature/Ecology; Urban Food; Green Streets; Views/Viewing Points. 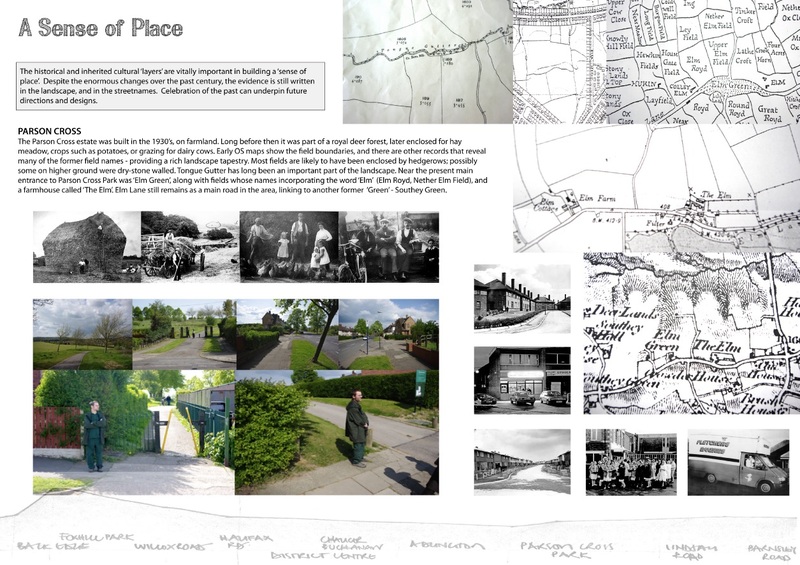 These are strongly grounded in 'place', 'place-names' and 'layers' in the landscape. 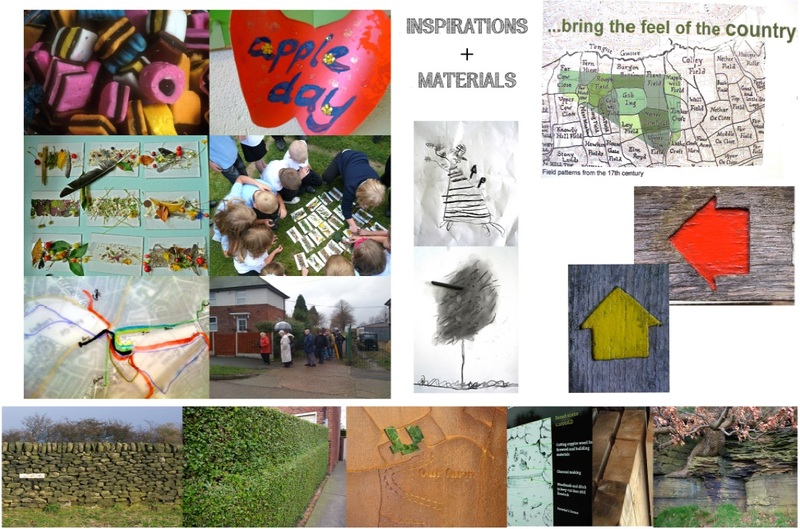 Some context information is presented here, as well as images from the engagement/consultation events. A follow-on project is documented here. "That's Adlington Community Centre...it's where I go for a meal once a week...it does look like a bit like a prison, with that fence...and that's where they planted lots of flowers, bulbs last year; I don't think they're going to do it again this year...it gets windy up here (in PX Park), it would be good to have more trees and a bit more shelter, but someone burnt a hedge recently...the motorbikes are a problem: Tom's always reporting them to the police, but they never catch them...these are good photos!...we had our photos on display last year, and went along to the exhibition... I'd like to do that again...'PX' - yes, that what I'd write, or sometime 'The Cross'...That's the notice for Tom's potato planting day; I remember when it was all potato fields here...and wheat fields too...these new houses are a long time coming...and that's where we go to play cards - no, I don't walk: I get a lift...all that rubbish there, and the skip; I don't think it makes the park entrance look very good, does it?...it's very dangerous that entrance: we've been asking for something to be done there for years and years now...there needs to be a footpath along one side...there's a good hedge on one side, but not the other...when they park their cars on the grass (roadside) it ruins it...that's Jim's monkeypuzzle tree - he started a campaign after a big one got chopped down nearby...I'm not sure if it's doing very well though...maybe need a bit of shelter...this is the walking group in that photo - we meet up every Monday and Thursday, but there are more people coming on a Monday....I used to work there in that surgery, as a nurse...Buchanan Road shops - that'll be Jim's photo - he lives next door to there...I don't use that shortcut: it's often far too muddy...it sticks to your shoes...the small entrances need something to say it's the Park...we do walk down Tongue Gutter sometimes...you can go all the way to the Barnsley Road, but the steps are closed there now...I've never been along that 'green-link' to Colley park - the one on the map...and that's Longley Park - it has lots of trees - not like here..."